In this unusual composition, perhaps illustrating an unidentified poetic subject, a noble lady stands beneath a fruit-laden mango tree. Her maids and the carriage driver wait nearby. 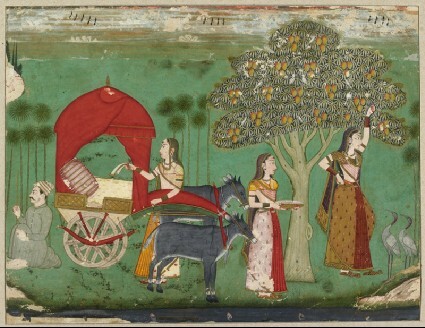 Her carriage is drawn by a pair of docile nilgai or bluebuck, a type of Indian antelope. The lady gazes abstractedly, perhaps feeling the absence of her lover, and she is approached by a pair of sarus cranes, proverbial in India for their conjugal fidelity. Meanwhile she reaches up to grasp a branch of the tree, recalling early Indian sculptural images of the shalabhanjika, the tree nymph or nature goddess who seizes a branch to awaken the tree and ensure its fertility.